← A beer fit for an ugly feminist. He’s gonna pay for it, but its the truth. A few days ago, a Moroccan family had been attacked by Urks. On Monday night the Boukhizzou family (of Dutch-Moroccan decent) was assaulted and harassed at their home. The argument started at a snack bar in Flevoland after a man’s girlfriend was allegedly insulted by a youth from the Dutch-Moroccan family. Nearly 100 “Urkers” (did I get this right?) went looking for revenge in Urk. It’s likely that race was also a factor in this attack, conjuring up anger and violence. Several men forced their way in, injuring the 36-year-old mother, 18-year-old Soufyan and his sister. Apparently, they were also chanting ‘Geert Wilders’ throughout the attack. The gang clashed with Police, who had been called to Urk from surrounding areas. Urk’s mayor Pieter van Maaren described the massive, hate-filled attack as “completely unacceptable”. Ah, okay; hadn’t heard about that. Thanks. That is the most reasonable, articulate communication regarding this volatile situation. But Anning is the bad guy? It’s when people who dare speak the truth are vilified that we finally realize society has flipped. Yes. 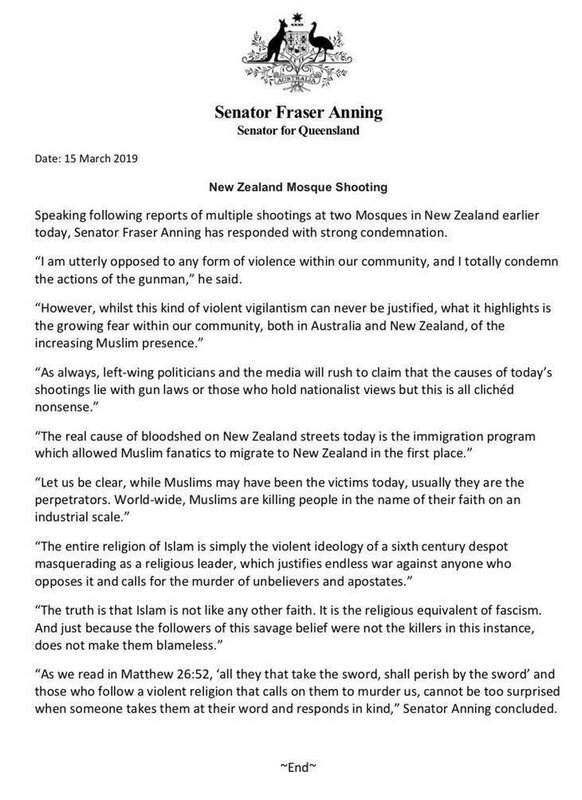 God bless Senator Anning, but I don’t doubt for a second that he’ll suffer repercussions of some sort for this. I’m sure that the majority of his constituents echo his sentiments (otherwise he wouldn’t be in office), but you can wager a year’s salary that the Australian branch of the Deep State that wants the country flooded with Mohammadan invaders isn’t about to tolerate such raw truth telling and pushback against the status quo. Only time will tell how this shakes out. That boy should be charged with battery. It tends to hold a more severe punishment. If he only recieves an assault charge it will be a miscarriage of justice. Preferable the charge should come after he slips on a banana peel 5 or 6 times.